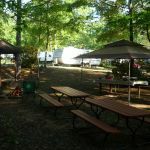 Ask fellow campers about "Kountry Air RV Park" and nearby attractions. Weekly rate was $176. Park is located among lots of trees. The wifi hotspot was located too far away for me to use it. T-Mobile service was spotty inside the camp ground. Propane was $24. It's a nice looking place with a lot of pull thru sites. The sites are all gravel but were level. The staff is very friendly. We camped at Kountry Air RV Park in a Fifth Wheel. Friendly people in this Mom & Pop campground. We were there just after Hurricane Michael and many sites were occupied by Floridian refugees. I was happy that the owner had contacted me to keep my reservation on, considering the special situation with the families searching a secure place while the hurricane destroyed a part of the Panhandle. The sites are mostly partly shaded and clean. Great place to visit Montgomery. 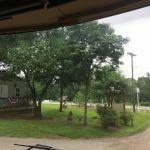 We camped at Kountry Air RV Park in a Travel Trailer. Not far away from Montgomery, which is a must to visit. It was Halloween weekend - we had been getting repairs in GA so no reservation ahead of time. We were so lucky to find this campground, definitely a work in progress but what a gem! Spacious wooded nice sites. The staff was friendly gave us info about what to see in this part of the country. She took us to our spot up top. We enjoyed our stay would come again if in the area. 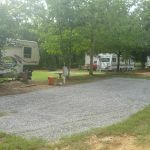 We camped at Kountry Air RV Park in a Motorhome. We really liked this campground. It is an older campground with fairly narrow roads, but we made it through just fine with our long bed pickup and 40' fifth wheel. We had a very long level pull through on the top of the hill. They did specify that sewer hoses had to be off the ground. Nice and dark at night except for a few people who felt compelled to leave their outside lights on, even when they weren't outside. Bathrooms were very clean although just one bathroom/shower for men, and one for women. Good laundry facilities. Very nice clean pool. The hosts were very friendly and knowledgeable about the area and gave good advice about where-to-go and what-to-do. Free movies and books to borrow. We would stay here again. We camped at Kountry Air RV Park in a Fifth Wheel. The lady at the office was extremely friendly and helpful. She was cheerful and led us to our site with a smile. However, the roads were very bumpy and pretty narrow for our MH. The site that we were assigned was pretty level, very shady, and very long. We were in a 42' MH. It was pretty expensive for what you get. We camped at Kountry Air RV Park in a Motorhome. We've stayed here in our motorhome several times, most recently as evacuees from Florida during Hurricane Irma. The owners are great and very accommodating. They have several spacious sites for large RV's up in the back of the park. We didn't use the bathrooms or showers but they appeared clean and well tended. All in all, a very nice experience. We'll be staying there again. We camped at Kountry Air RV Park in a Motorhome. Pratville, AL is close by with shopping and restaurants. Pretty town with a river running through it. Beautiful, clean and friendly owners. Appealing landscaping, many trees and flowers. Most sites are quite large and park is quiet. Units here are above average, no junk sitting around. Bath house and other buildings are older but appear to be well maintained. Only drawback I could see is that some sites are small (suitable for smaller campers) and you would need leveling. You go up a hill to get to many sites, road is not paved. Did see larger fifth wheels and motorhomes and some sites are pull throughs. Owner ran outside to tell us antenna was still up, she escorted is to our site last nite. We did not call ahead make a reservation and we got here about 6:30pm. We camped at Kountry Air RV Park in a Motorhome. Having left a state park in Selma with disgust, they had a space for me with no reservations. The campground hosts were really great and friendly. They went out of their was to accommodate and make you content. The only issue I had with the park was that I could not get any TV stations besides PBS through my antenna. I wanted to visit Prattville and the hosts gave us maps, and suggestions and they were all great tips. Great place! 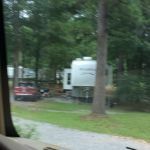 We camped at Kountry Air RV Park in a Travel Trailer. It is less than 15 miles from Prattville with a lot to see including museums and Artesian wells to drink from. Near the Interstate 65 intersection is plenty of shopping in chain stores. An older park undergoing renovation by new owners. Several long term residents including some leftover from previous owner. The majority of sites are full hookup but ours was water and electric only. There is no dump station. The owners are very helpful - even walking with us to our site after a heavy rainstorm that caused erosion in front of our site that would have made it impossible to pull out of our site. As promised, the next day brought gravel fill in front of our site and allowed us to leave without problems. The owners spend most of their days cleaning up the park and working on flower beds. The previous owner left numerous concrete statues throughout the park that add a bit of an eclectic appearance. It isn't much to look at from the road and there are some interior roads that have washed out but the owners are working on road repairs. Near the new sites is a , separate laundry/restroom that is clean and neat. The city of Prattville is historic and offers shopping, restaurants, and a little museum near the old factory that gives the city its name. We would definitely return. We camped at Kountry Air RV Park in a Fifth Wheel. Visit the museum and historic areas in Prattville. There are several restaurants in the historic area including a Cajun cafeteria and a popsicle shop. There are also several shopping areas and the usual chain restaurants on the east side of the city. Campground is nice and clean with friendly owners. Great quiet area. We camped at Kountry Air RV Park in a Motorhome. Not quite as pictured on their website. Seems to be a lot of long term construction workers staying here. There is 4 pages of rules and regulations that they go through with you at check-in. The laundry and restroom facilities are clean but dated. Very friendly owners who seem to care about their guests. If traveling through the area again I would look for somewhere else to stay only because it is a little far off the interstate. We camped at Kountry Air RV Park in a Fifth Wheel. Stopped here for an overnight stay. A bit of a drive, only about 20 minutes from the interstate, but worth it to not be in a parking lot for the night. Owners were very polite and helpful. Owners helped get to the site and even helped me hook up. Lots of personal touch they have given it like gardens and such. Pool was clean and cool, nice for the kiddos to wear some energy out from the road trip. We even had a swing hanging from the tree In our site. Worth the time off the highway from Montgomery! We camped at Kountry Air RV Park in a Travel Trailer. Selma, AL was only 30 minutes west. Lots of civil rights history was made there. There are a lot of historical buildings there. Owners are awesome. Mr owner escorted us to our site and stayed to help hook up water and electric. Great pool, they even provide floats and noodles. Will definitely stay here again. We camped at Kountry Air RV Park in a Motorhome. We have stayed at this campground twice, and both times the owners were wonderful, friendly, helpful. They even gave us fresh vegetables from their garden to go with our dinner. The above ground pool is sparkling and immaculate. We will stay here again just so we can spend time with the owners again, very happy people. We camped at Kountry Air RV Park in a Motorhome. I was here for only one night but was charmed by the park and the owners. They went out of their way to make sure I got situated. The park is a gardener's delight with flower beds and other nice touches. Wi-fi was good and restrooms clean. Most of all, I simply liked the spirit of the place. We camped at Kountry Air RV Park in a Truck Camper. Eat at Uncle Mick's in Pratville beat Cajun outside Louisiana. Are you affiliated with Kountry Air RV Park ?